Relive four seasons of the action and adventure on the high seas when Michael Bay’s Black Sails: The Complete Collection arrives on Blu-ray™ (plus Digital) and DVD October 16 from Lionsgate. 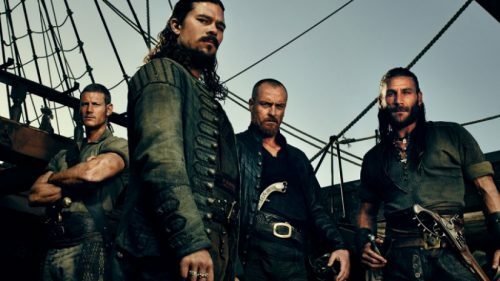 The three-time Primetime Emmy® Award-winning series (Outstanding Sound Editing, 2016; Outstanding Special and Visual Effects and Sound Editing, 2014) tells the classic story of feared pirate Captain Flint and his many foes — from Captain Charles Vane to the legendary Long John Silver, and many more — twenty years prior to Robert Louis Stevenson’s classic novel, Treasure Island. With over 2 hours of special features, Black Sails: The Complete Collection on Blu-ray and DVD includes all 4 seasons – 38 episodes — on a 12-disc set for the suggested retail price of $59.99 and $49.98, respectively.